During a job application period, not only the applicants will face pressure, but also the hiring manager and the staff who will be selecting who among their applicants will be employed to grow the company. The selection process is not an easy phase to complete since there are a lot of considerations and steps to take, such as calling and inquiring about the applicant for a reference check and background verification. What Is a Telephone Reference Check Form? 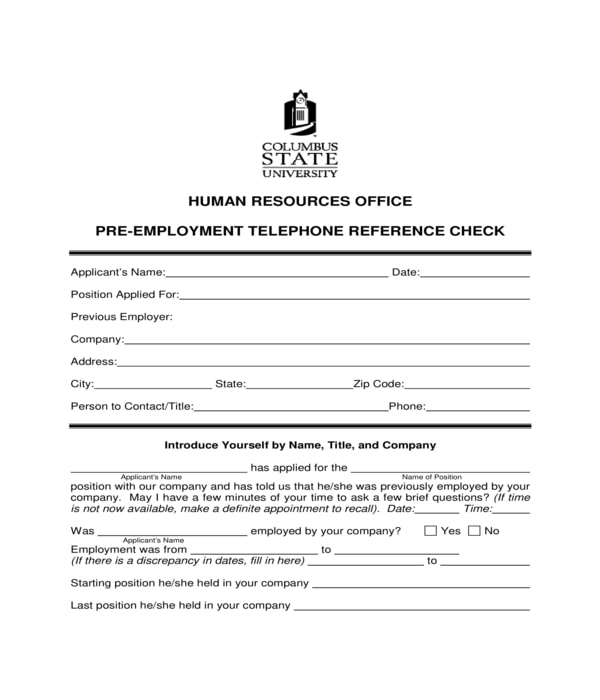 A telephone reference check form is a valuable type of HR form to be used by the hiring manager and staff of a company. The purpose of this form is to obtain facts and verify the data or information which are claimed by an applicant in his job application form and resume. Moreover, telephone reference check forms are only used after the interview phase of a hiring procedure. What Data and Information Should Be Disclosed in a Telephone Reference Check Form? There can be different types of information to be disclosed or be stated in a telephone reference check form. And one of the most important would be the details to identify who the applicant is. 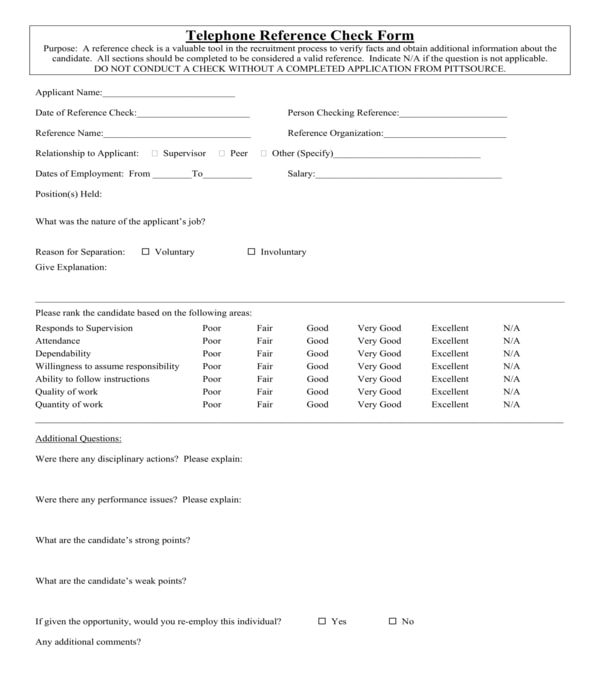 For this, an applicant information section must be filled out by the hiring manager wherein the name of the applicant, the position that he is applying for, and the date when he was interviewed in the company will be stated. The basic data of the applicant’s character reference person will also be included in the form. Specifically, the reference person’s name, organization, and his relationship with the applicant will be stated along with the person’s position in the company. Additionally, a ranking section for documenting the ratings that the reference person gives in lieu of the applicant’s qualities and skills is also in the form, as well as a questionnaire and a comment section for recording the statements and the explanations of the reference person. 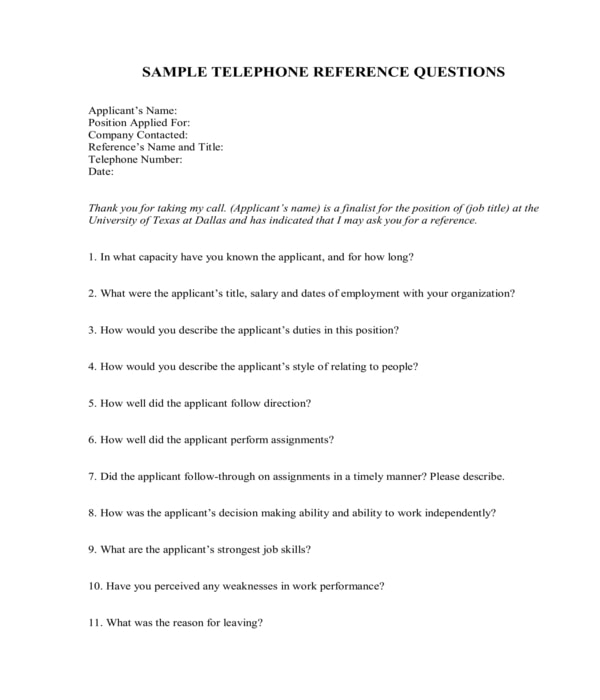 College Telephone Reference Check Form – This is the type of telephone reference check form to be used by educational institutions for their job applicant selection process. The form contains four sections to be completed by the verifying personnel of the institution. The applicant’s information will be stated in the first section of the form which will not only document the applicant’s name but also his position, the date when the verification was conducted, and the name of the verifying personnel. The second section is for the contact information of the reference person while the third section collects the basic employment details of the applicant. Lastly, the ratings and comments of the reference person will be indicated in the fourth section of the form where there is a table intended for evaluating the applicant. 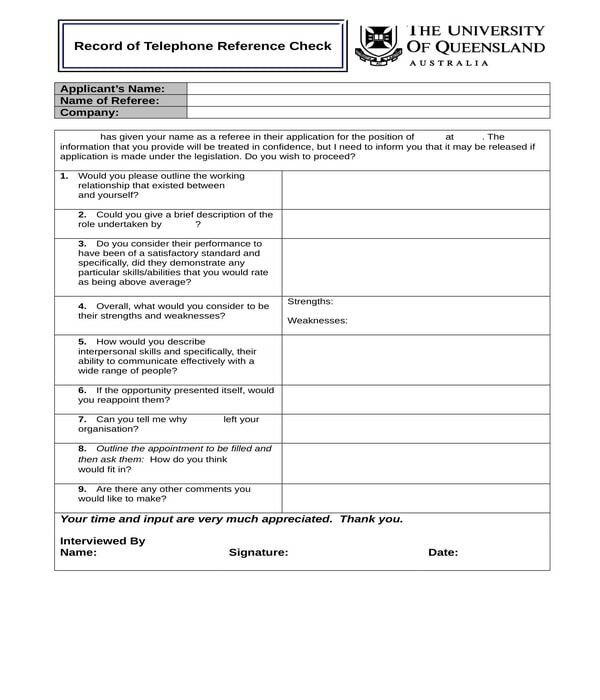 Pre-Employment Telephone Reference Check Form – This is another form variety which can be used by schools for assessing and conducting a background check of an applicant. 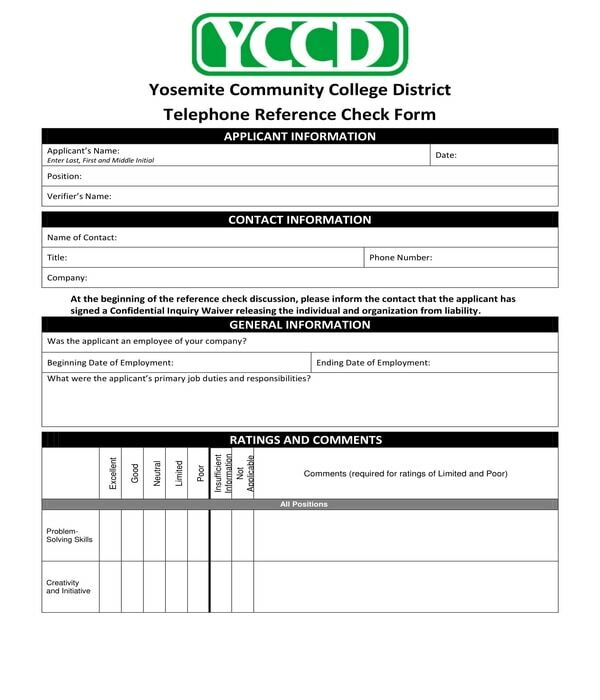 However, compared to the aforementioned college telephone reference check form, this variety only contains two sections wherein the first section documents the applicant’s and the reference person’s details. A guide of how the verifying personnel can introduce himself to the reference person will be stated in the second section of the form along with a few questions which center on the strongest and weakest points of the applicant. 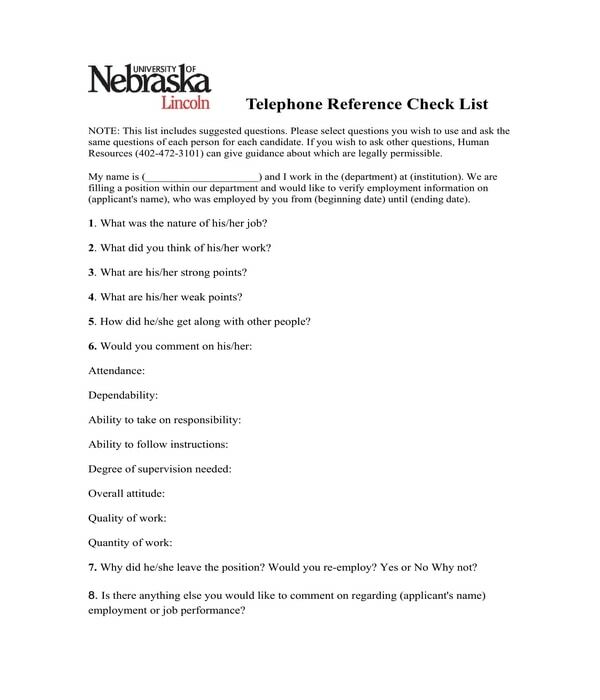 Telephone Reference Check List Form – Eight questions are listed in this form which should be asked by the verifying person to each of the job applicant’s character reference person. The questions focus on identifying the nature of the applicant’s job along with the applicant’s quality of work, and the reason why the applicant has left the company. The preference of the applicant’s reference person of whether he will hire the applicant again in the company or not will also be documented in the form as well as his reason why or why not. What Questions to Include in a Telephone Reference Check Form? How well did the job applicant perform his assigned tasks and obligations? This type of question will acknowledge the quality and the ability of the applicant in meeting the standards of the company that he worked in. Additionally, the question will also let the reference person expound on the details of the applicant’s role and day-to-day responsibilities to allow the verifying person in determining the connection of the applicant’s previous job to the current position that he is applying for. What are the job applicant’s weaknesses and did it affect his performance or not? Identifying the applicant’s weakness will give an idea to the verifying person of whether or not the applicant can withstand the demands of the job or not. For instance, if the applicant is not a people-person, then he should not be considered as a candidate for a leadership role in the company unless the applicant has presented that he had taken training programs to address his weak areas. What was the job applicant’s reason for leaving the company? This question will allow the verifying person to identify whether the reason why the applicant left is rational or not. By knowing the applicant’s departure reason, the verifying person can inform the hiring manager of what they must look out for, especially if the applicant’s character reference persons have reported that the applicant left without giving prior notice. This ensures that the company will not become a victim of an applicant who ghosts his employers due to unknown reasons. Since reference checks can become personal, it is important that the verifying person will use the form with full accountability and will observe confidentiality. 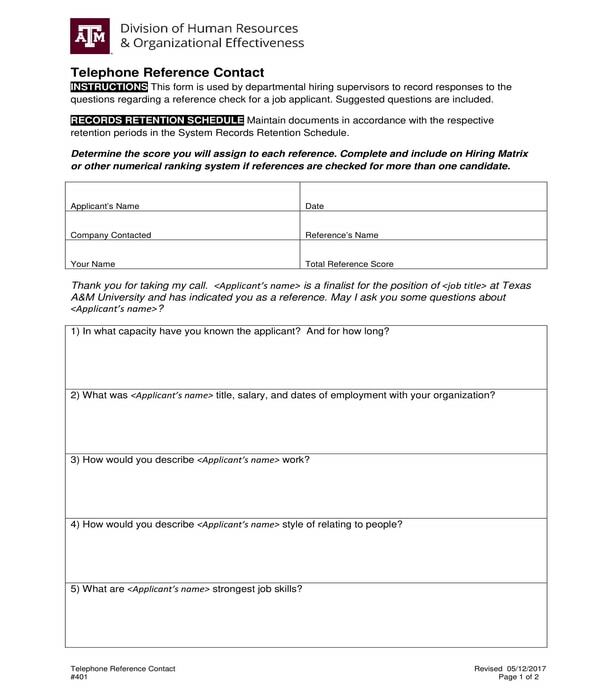 Nevertheless, the statements in a telephone reference check form must only be known by those who are involved in the process of deciding whether or not to hire a job applicant to fill in the company’s vacant job position.